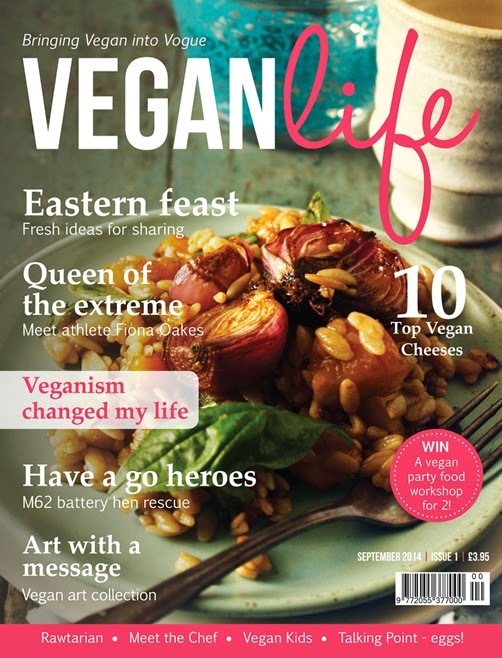 Last month I blogged a preview into the new magazine, Vegan Life Magazine. The first issue has finally been released, and the above quote sits on the very bottom of the Editor's Page, setting the tone for this new publication. I've read the whole issue front to back, and I'm excited to share my thoughts with you. This magazine is huge! It's at least 100 pages of relevant vegan information and ads. The content is expansive, covering news, interviews, food, beauty, lifestyle, travel, resources, and much more. As a UK-based magazine, Vegan Life covers a lot of UK news, but it offers relevant US and international news as well. The features I loved the most were focused on other vegans, from a woman's journey to veganism after a cancer diagnosis to a woman raising her two boys as vegans. I also enjoyed the article on a really ambitious vegan marathon runner (as an avid boot camper I'm always drawn to vegan athletes). And don't get me started on the incredible story of a woman who rescued thousands of battery hens after a wreck near her home. It had me asking myself "What am I doing with my life?" in a good way. My favorite article is on Donald Watson, the man who founded the Vegan Society in 1944. It's a fascinating story, and all vegans should know about him. He was a remarkable man who did so much for this lifestyle. Let's be real, the reason I read magazines is for the food. Vegan Life Magazine is full of food. I don't think I've ever seen this many recipes in a lifestyle magazine. There are raw recipes, a cheesecake recipe, and a whole feature on an Eastern feast that includes recipes. Usually, I find one or two foods to drool over in magazines, but I have plans to make every single recipe featured in this issue - starting with the Raw Apple Walnut Cake! If you'd like to try one of the recipes, veganlifemag.co.uk has the recipe for the Soba Noodle Salad featured in the Eastern Feast. Yum! One more thing I have to mention is the Top Blog feature. As a blogger, this made me giddy with pride. I want to high five other bloggers when I know they're being acknowledged. This issue features the lovely woman behind peasoupeats.com which is a gorgeous blog that everyone should check out. While there are many great vegan magazines out there I feel like this is the first one to cover any and everything. No matter what part of veganism interests you, you will find something you like. This review only covers bits and pieces. It's just so big! Congratulations, Vegan Life Magazine! I can't wait for your next issue. For more information please see subscription details here. Disclaimer: I am apart of Vegan Life Magazine's Vegan Blogger Community, and have been given a free subscription in exchange for a review. That being said, all my thoughts are genuine, and my opinions are my own. My reviews are not guided.